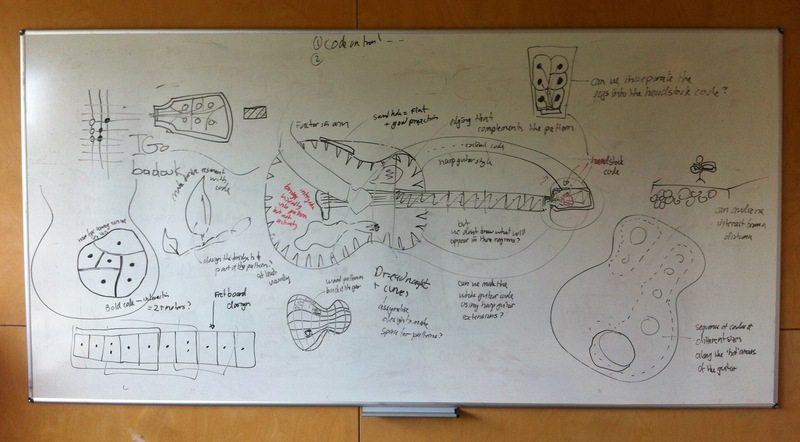 We gathered our team together for an intense brainstorming session so as to come up with an overall design for the Carolan guitar and to establish some principles for decorating it with aestheticodes and mapping these to different interactive functions. Several hours and two whiteboards later we seemed to have generated far more questions than answers. Some are the sorts of questions faced by anyone building a guitar. What type of guitar should it be? What shape and size? What tonewoods should we use? Should there be a cutaway? Where might we locate the sound holes? and so forth. Others are new questions, concerned with the placement and meaning of the interactive patterning. Should we have an interactive headstock logo? How can we decorate the soundboard, back or sides? What about codes that run under the strings – how will people interact with these? Or can the strings and the tuning pegs be made part of the codes? Can a sound hole be made part of a code? Or the bridge? Or the fret markers? How will these patterns be crafted? Inlay, etching, cutting, staining? Who will interact with the guitar? The owner, luthier, player, potential buyer, or even the audience at a performance? How will it be displayed to them? On a stand, in a window, of held on stage? If so will the player’s arms get in the way? And what stories will it tell or gather? Official provenance? Technical documentation about its construction and maintenance? Stories of where it has been? Recordings of songs that it has played? It has soon become apparent that designing our guitar is a complex task, brimming with possibilities. Who would have thought that decorating just one object would raise so many questions about the relationship between structure, decoration, form, function, use, context and interaction? We clearly need to explore the space of possibilities before we can narrow down on a final design. It’s time to get prototyping.